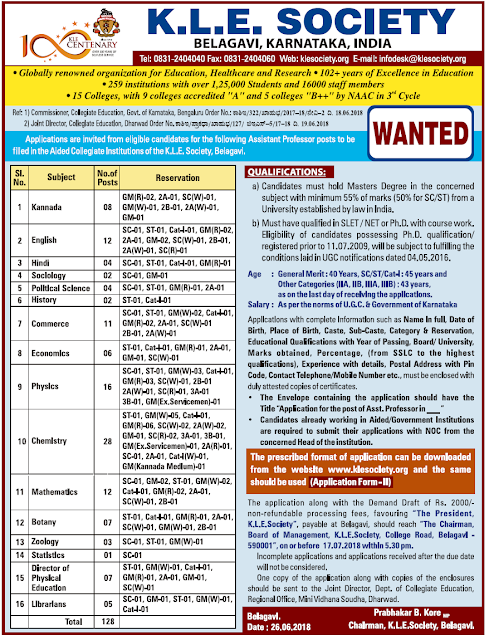 K.L.E.Society, Belagavi has advertised in the DECCAN HERALD newspaper for the recruitment of Teaching Faculty- Assistant Professor Plus Non-Faculty jobs vacancies. Interested and eligible job aspirants are requested to apply 17th July 2018. Check out further more details below. About College: Karnatak Lingayat Education Society (KLE Society) was founded in 1916 by seven educated youth with the objective of bringing education to the Kannada-speaking region of the erstwhile Bombay Presidency and what is today the North Karnataka region. Headquartered at Belagavi, KLE Society runs over 250 educational institutions in Karnataka and Maharashtra. On 13 November 1916, KLE Society started an Anglo Vernacular School in Belagavi. Lingaraj College came into existence in June 1933. In 1947, B.V. Bhoomaraddi College of Engineering and Technology was started in Hubli. How to Apply: Interested and eligible candidates are requested to send applications with complete information and Demand draft of Rs.2000/- non refundable processing fees favouring "The President, KLE Society", payable at Belagavi should reach following address on or before 17th July 2018 with in 5:30 pm. The Envelope containing the application should have the title "Application for the post of Asst. Professor in _______ "